Indelible Ink is a book I heard about in an interview with Christos Tsiolkas, and which I reserved at the library while under the influence of a few glasses of Shiraz one Saturday night. A couple of days later, I read Bree’s post on the book and began to have second thoughts about the whole affair (the hangover probably didn’t help either). Luckily though, I gave it a go and was pleasantly surprised; it’s a book which is well worth the effort. You wouldn’t be alone in thinking that Marie doesn’t sound all that sympathetic a character (it is difficult to feel sorry for someone who is sitting on – or in – a few million dollars), but luckily that’s not the intent. Marie is well aware that the sale is the result of her own shortcomings, and it is her decision to throw caution to the wind (in this case, the lovely breeze coming off the harbour) that wins the reader over. Besides, if you think Marie sounds a little vapid and shallow, just wait until you meet her family and friends. 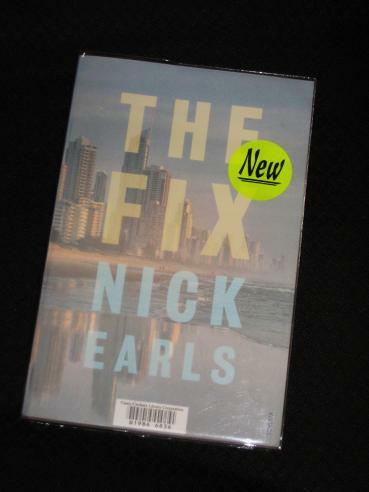 The reader is also given a small glimpse of the high life in Nick Earls’ latest novel, The Fix. Set, as usual, up in sunny Brisbane, The Fix is a story of a story, and how things are never quite what they seem. Josh has just come back to Australia after a few years working as a spin doctor in London, and while he is waiting to get back into his first love of journalism (and writing a newspaper blog to earn a few bucks in the meantime! ), he is approached to carry out a PR campaign for a lawyer receiving a medal for bravery. I was a little hesitant on starting this book because Earls is a writer who started off writing lad-lit in the vein of Nick Hornby and Mike Gayle, and I wasn’t sure if an older, more literary me would still enjoy his work (Gayle is one whose books I now avoid…). An hour later, and a hundred pages down, I was safely able to take those fears and dump them in the Brisbane river; The Fix is a riveting read. There were a few uncomfortable moments (I’m not sure a scene with a Korean businessman was strictly necessary, or appropriate), but what I like about Earls is that he has kept his earlier eye for the humorous side of life and combined it with a more developed sense of the darkness that lies beneath it. The longer the book goes on, the more uneasy Ben becomes – and the more obsessed the reader becomes with uncovering the truth. But what is ‘truth’, and is it ever possible to get to the bottom of anything, particularly someone’s character? On starting this post, I was thinking of writing something about how Earls has moved on from lad-lit and is working towards writing more complex and literary novels, thinking that this one would be another step in the same direction. After finishing the book, I would have to say that I’ve changed my mind – this is the book that marks him as more than a humorous chronicler of the lives of thirty-something Brisbanites. The descriptive writing may not be as elegant as I might want it to be, but The Fix is a fabulous, multi-layered work which will, I’m sure, stand up to rereading. 20 books! That's an achievement. I have a few Australian authors on my pile, might have a look at the challenge. From March on I would have a bit of time. I like Hornby, not sure about Gayle (if I have read him). I make a note of the The Fix, I think I might like it. I was very happy with 'The Fix'; in fact, on reflection, I'm still not completely sure I got everything at the end of the book. There are definitely many questions to be asked. I do this copy pasting all the time btw. It never affected me. …so don't be surprised to see my Kleist posts pop up at some point! Shamefully I don't think I've read a single Australian author this year. No, wait, I read Shirley Hazzard, who eventually moved to the US. Maybe she still counts? I sort of like a tattoo being the impetus to a life change–not that I would ever do that, but I still like it. Definitely time to read more then 😉 Seriously, I doubt I'd read anything by an Aussie before moving here, so this challenge has been a good opportunity to make up for that. I'm afraid I've never read any Australian writer but Max Barry. Congrats on the 20 books! I love that you requested a book after drinking! Others I like include Elliot Perlman, Christos Tsiolkas, Arnold Zable and Patrick White. I've only read the odd book by female writers though, apart from Helen Garner. TBM – It's not a good habit to get into! I went through a bit of a library phase, and a few times I woke up on Sunday thinking “What did I reserve at the library last night?”. I've had Tim Winton recommended to me–maybe I will track something by him down. Have you read Kate Grenville? I read one of her earlier novels years ago, but nothing recently. I've wanted to read The Secret River since it was listed for the Booker. Maybe next year will be its year. I guess I had better start a list as I seem to be making these sorts of proclamations all over on blogs at the moment. Very glad to hear you enjoyed Indelible Ink – that one is getting very close to the top of my TBR pile. I probably should read an Earls one day, being set in my home town.